Presenting a fresh interpretation of outdoor lounge furniture, the Vaya Family offers a modern take on taking a break. Designed to invite rest and relaxation, the family includes chairs, benches and tables in two sizes. Vaya benches and chairs have reclined backs and a lower stance for a leisurely level of comfort; slats of FSC® 100% Cumaru hardwood add a welcoming look and feel. Tables are available in coffee- and side-table models; top options for both include tempered glass or FSC® 100% Cumaru hardwood slats. Glass tops can be clear glass; standard patterns from our ViviGraphix and ViviChrome laminated glass families; or fully customized using our vast VividGlass line. Vaya bench, chair and table frames are powdercoated aluminum in a full range of standard and custom powdercoat colors. While the group’s clean lines keep the look light, each Vaya product has a substantial weight and feel for solid but versatile placement. 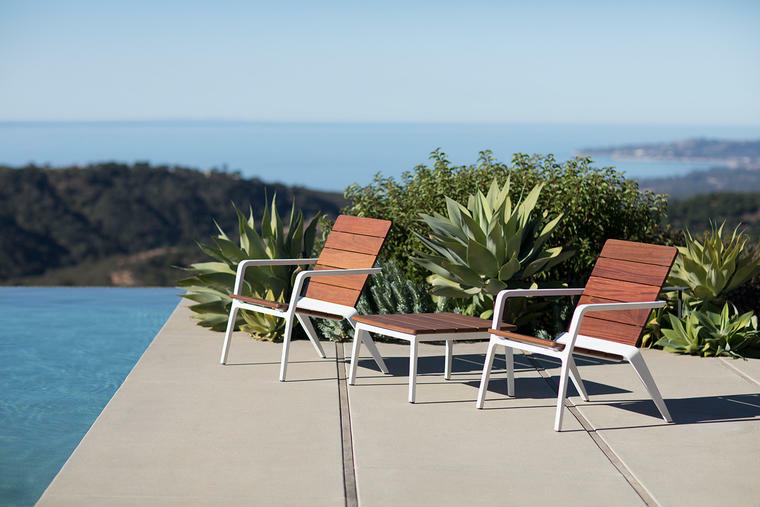 Designed for years of use, Vaya is as durable as it is beautiful and a perfect choice for outdoor living spaces, resorts and hotels, roof decks, campus courtyards, and other gathering areas. Ready to relax? Sit back and learn more about the Vaya Family.